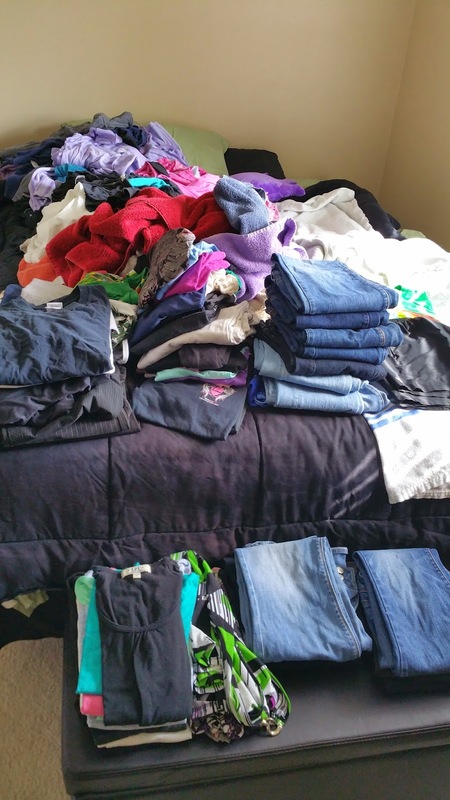 This mountain equals about 4 loads of laundry. After taking an entire day to wash and dry everything, I've realized that this is just laziness. 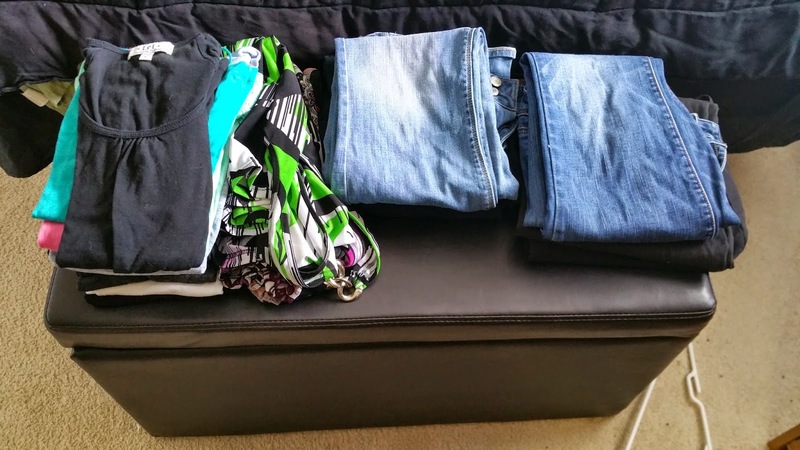 I needed to put a stop to it, so I decided downsizing my wardrobe would be my first project for this blog. On top of downsizing, I would be able to find and wear that favorite shirt a little more often. 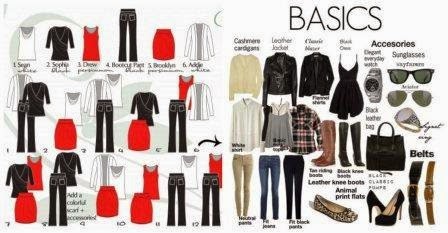 Below are the steps I took to reduce the clothes from my closet. Obviously the first step is to wash everything. Then dump it on your bed. Make a list of essentials. I used pictures from Google images as inspiration to cut down. I'm a simple woman so I don't need many accessories. However, if you feel you need them, write them down. The following picture was found on http://lifestyle.sg.88db.com/things-to-do-that-dont-cost-money/. It helped me tremendously put together my first list. Transitioning from the mountain to a list was a difficult task. It requires a lot of patience and retraining your brain to stop from thinking you need everything. Eventually, I will try to downsize again, but for now, this works for me. Everything I wanted to keep, was separated and folded. The remainder of my items were placed in garbage bags and moved under the bed. This allowed me to adjust to my new wardrobe and if I did absolutely need anything, I could grab it. The clothes are staying under my bed for about 4-6 months. If in that time, I don't grab anything, they will be donated or given to friends. This is just my personal experience downsizing. If you feel you're okay with going straight to the donation center, I admire you. So far, the results have been pleasant. I'm on week 2 with my downsized wardrobe and have only worn the clothes I really enjoy. I feel fresh and dressed for any occasion. I've had nothing but compliments recently. It's definitely motivating. **As time goes on, I'll update this post to share the changes I've made, including more pictures. Til then, I want to hear your minimalistic approach to your wardrobe and the steps that were taken to reduce it! I would also like pictures of the results! 01-06-15: I went to London with just a backpack. See my minimal list for the journey here. 05-25-2016: It's been well over a year since I've written this post. At this current time, I feel that it is a tad misleading since my work has changed. This week I'll be working on a more updated post of everything I brought with me for my new work wardrobe. Check back soon! I did some of my own research along with using my own personal experiences to generate a list of helpful tips regarding Craigslist. This is to help you sell your items quicker, easier, and safer. You can view my tips below the links listed. If you choose to select the links, some may include pop-ups. As I come across more helpful suggestions, I will be updating the article accordingly. Otherwise, be safe and happy listing! Take high quality pictures. Show the good, the bad, AND the ugly. No one likes to be misled, especially in a sale. Make sure to use a significant amount of light. Bad pictures will deter potential buyers as well. Don't give personal information unless you know that it's safe! Personal information includes your name, email, home address, and phone number. Update the status of your items. If they are sold, please remove it from the list. This reduces useless traffic. If they are still for sale, offer a better price or more pictures. Place your ad in the closest surrounding cities. For instance I live in the Treasure Coast, therefore, I would choose West Palm Beach and Vero Beach. The wording may have to be changed in some of the posts as it may look like spam. Craigslist is great for moving products out of your home/office fast. It's also great for employing help. If you have a small business and are looking for extra hands, try it out! Be warned though, there are a lot of Joe Shmoe's off the street. You might not find the perfect person for the job in the first couple interviews. It's always best to add in your listing if the items are considered new or used. Tell potential buyers if your items are from a non-smoking home or free of animal dander. Nothing is worse than getting hit by a wall of stench. Not to mention, the items will smell like their environment and someone could be allergic to animal dander. OBO: Or Best Offer. This will attract more buyers. Set the price of your item a little higher than the lowest price you'll absolutely go. One, it makes the buyer feel good that they were able to haggle you down. Two, you didn't go lower than your bare minimum. People always like to feel they got the "best" deal. If you do decide to use your phone number, do not put it in the ad as 123-456-7890. You will have an abundance of spam sent to you right away including telemarketers calling you constantly. Make sure to mix it up a bit by changing some of the numbers to actual words. One23-four56-seven890. This deters bots from finding your phone number in the listing. Use an email address you don't mind getting scammed unless you're familiar with what a scam email looks like. For me, I use my personal email because I have it linked to my phone in case of an instant reply. Choose a mutual place to exchange items and money. Don't meet up with someone in the dark unless you know the person. For me personally, I like to choose the Wendy's parking lot down the road. It's perfect, close, and lit up from all the parking lights. Have junk? You can add that on Craigslist under the free items section. Be sure to add FREE or Curb Alert in the title so others can pick your junk up even quicker. Curb Alert allows you to literally place your items at the end of your driveway, list your address, and not have to deal with other people face to face. They simply come and pick the items up. If accepting cash, don't be afraid to invest in a counterfeit marker. This will save you loads of trouble when bringing your money to the bank. Every couple days, update your post. This will place your ad at the top of the list, increasing the chances of someone taking an interest in what you have to sell. If you have a website to link to your products, do it. Millions of people use craigslist for a multitude of things. Increase your exposure. If there is an agreement on a price with a customer, do not sell it to someone else without communicating. This can create turmoil as the stranger now might have personal information to retaliate. Let the other party know there is an interest before completely ignoring them. They may have cancelled their plans and now have to reschedule. Remove posts if they are no longer up to date. People don't want to waste their time if the item is no longer available. First off, I want to say, amazing app. I've been using it for a year now and can completely keep track of all my credit. Though I only have 2, my car and credit card, I can assure myself I am on the right path every month. Credit Karma works with TransUnion, one of the 3 major credit bureaus. When first signing up, Credit Karma does a soft hit on your credit report to give you your score. Credit Karma will not look at your score again. Instead, monthly, a new estimated credit score is given to you based on your record. What's the difference between a soft hit and a hard hit? Hard hits permanently stay on your record for approximately 2 years. I just watched my third hard hit get removed! Hard hits are generated when applying for a new loan such as a car, credit card, or house. It's a hard hit because the banks are about to lend you money. If multiple hits are generated at the same time, it can affect your credit score negatively by reducing the number. Soft hits only check your credit and is similar to a background check. * To view more information about the differences in soft and hard inquiries, visit Credit Karma. I definitely give the creators two thumbs up for this app and 5 stars! I highly recommend it for everyone to keep track of their personal life and be able to set realistic goals for themselves. *Be sure to do your own research to make sure certain hits stay off your credit.